Initially known as the Ontario 21, the dogs confiscated from a suspected fighting operation became 29 when one of them gave birth while in custody. 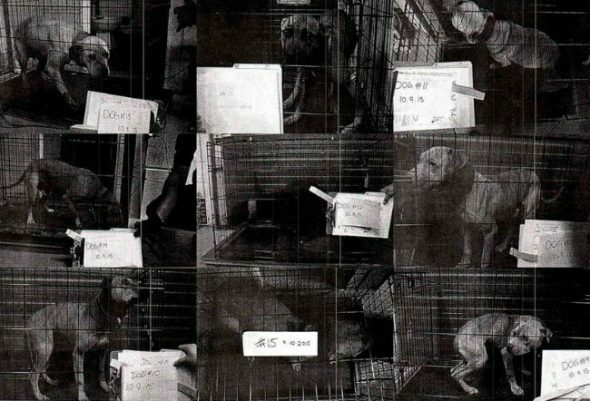 Years ago, police in Ontario rescued 31 sickly dogs from a suspected fighting operation. They were pit bulls, a “breed” long since banned in this Canadian province, but they were also evidence in a court case, so they were remanded to an undisclosed shelter while a court determined what would happen. As often goes in the realm of the legal, they waited a long time. The Ontario Society for the Prevention of Cruelty to Animals (SPCA) pressed for all of them to be put down, arguing that as they had only known violence, they were a lost cause. Dog Tales Rescue and Sanctuary, however, asked for the dogs to be released into their care, where they could be rehabilitated and eventually find their way to real families. Along the way, one of the dogs who had arrived to the shelter pregnant, added 8 new puppies to the controversy. Finally, in July of 2017, a judge made a ruling. The dogs (except for one deemed too dangerous and two who died while in custody) would be released into rescue and hit the long road to rehabilitation. One of the roads led all the way to Jacksonville, FL, where 14 of the dogs landed in the care of a rescue called Pit Sisters. A few of them were from the litter born at the shelter. 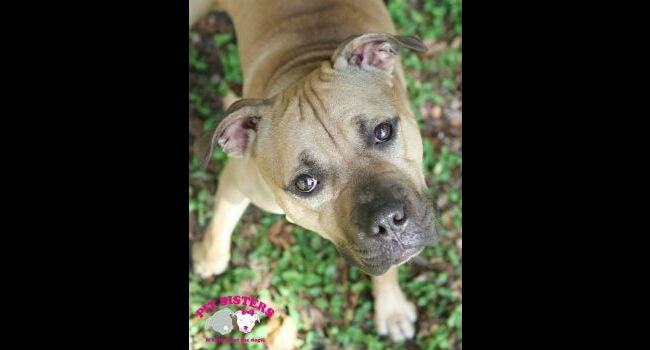 “They only knew a shelter life,” Jen Deane, founder of Pit Sisters, told Mother Nature Network. In early assessments, one of those puppies — a dog named Dallas — drew attention. “The more we worked with him, the more we thought he should be a police dog,” Deane said. 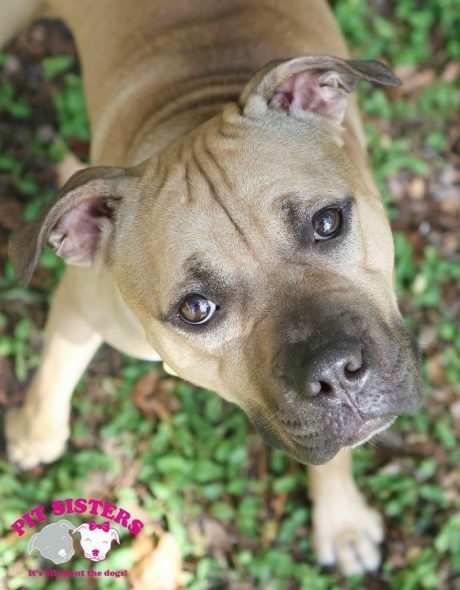 So trainers spent a few days testing him and they eventually connected with someone from the Throwaway Dogs Project, a Philadelphia organization specializing in dogs often seen as beyond help — and turning them into police dogs. Dallas, of course, was just a pup. He hadn’t done anything wrong, but rather was guilty by association — for his breed. Throwaway Dogs founder Carol Skaziak, along with a team of behaviorists, headed to Jacksonville, where they spent several days testing Dallas. Dallas’ high energy level and play drive made him a great fit for a career as a K-9. It’s a skill Skazniak looks for in candidates for the program. Not the best quality for a family pet, but for police dogs, it’s essential. But there was one crucial strike against Dallas: He was deathly afraid of cars — so much so that he couldn’t bring himself to get inside one. On their way back to Pennsylvania, the trainers told Deane if Dallas could get over that fear, they would try to land him a job as a K9. Not long afterward, Deane — a trainer with a gift for bringing out the best in dogs — sent Throwaway Dogs a video of Dallas jumping in and out of cars with unflinching enthusiasm. Dallas was officially in the program. Not long after that, Deane got a text message: A police department in Virginia had offered Dallas a job. And all of a sudden, the dog who nearly never left that secret shelter in Ontario — a dog who was born a victim — will now spend the rest of his life standing up for them. With a lot of people cheering for him along the way. For those of us who are dog lovers, love is unconditional. It grabs our heart & squeezes tightly every time we lay eyes on a dog. Any dog. Breeds don’t matter to those like me & the rest of readers who follow Life With Dogs. This story brings tears to my eyes for the dogs that were saved from fighting then almost lost their lives without a chance to learn that humans can be good. And I’m cheering for a little pittie type dog who is destined to teach humanity that the bully breeds have a collective heart as big as the earth if only given a chance. For all the bully breeds slaughtered daily in kill shelters, abused by monsters who walk on 2 feet this little dog is a voice to tell their story & hopefully change lives for all dogs. Thank you to the rescues who went out on a limb to save dogs, the trainers who traveled to help by evaluating and the police department who gave him a life with purpose. May this dog live long and be protected by the grace of God in his work.